The scoring of the Yoan Pablo Hernandez-Steve Cunningham fight was absurd. The result wasn’t. And the fight itself? Fantastic. 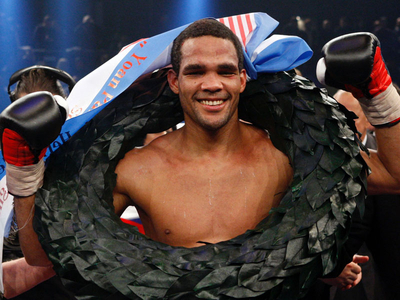 Hernandez defeated his American rival by a unanimous decision to win the vacant RING cruiserweight championship and retain his IBF 200-pound title Saturday night in Frankfurt, Germany, the Cuban’s adopted homeland. THE RING title had been vacant since Tomasz Adamek gave it up early in 2009 to campaign at heavyweight. Cunningham (24-4, 12 knockouts) appeared to be finished in the fourth round, in which Hernandez (26-1, 13 KOs) put him down twice and hurt him badly. However, the 35-year-old veteran survived and rallied to make it competitive. Two of the judges – Alejandro Lopez of Mexico and Pasquale Procopio of Canada – scored it 116-110 in Hernandez’s favor, meaning they believed he won eight of the 12 rounds. The British broadcasters were surprised when they heard those scores, as was THE RING, which scored it a 113-113 draw. The third judge – Massimiliano Bianco of Italy – had it 115-111. The saving grace is that one can reasonably argue that Hernandez did enough to win the fight even if he didn’t erase the bad taste left over from their first meeting in October, which Hernandez won by a sixth-round technical decision after he was cut and couldn’t continue. On Saturday, Hernandez used vicious body work to get off to a fast start in the first three rounds but he made his largest statement in the fourth. Hernandez, THE RING's No. 1-rated cruiserweight going into the fight, landed a short left that sent No. 2-rated Cunningham to the canvas about half way through the round. Cunningham, obviously dazed, tried to get up but stumbled and fell again before staggering to his feet. Moments later Cunningham, still disoriented, went down again as a result of a flurry with about 40 seconds remaining in the round and was serious trouble. Somehow he made it the bell but his prospects appeared to be dim. Hernandez, eight years Cunningham’s junior and brimming with confidence, seemed to be in complete control. Cunningham turned things around quickly, though. He landed a hard right early in the next round the seemed to affect Hernandez both physically and emotionally as the Cuban began to fight more cautiously. That allowed Cunningham to outwork Hernandez over the next several rounds and climb back into the fight. THE RING gave Cunningham rounds five through nine, giving him a one-point lead going into championship rounds. Each of the last three rounds, in which both fighters were tired yet still determined, could’ve gone either way. THE RING gave Hernandez the 10th and 12th rounds, which resulted in a draw on our card. The fight seemed to be up in the air after the final bell. However, the judges – particularly Lopez and Procopio – didn’t see it that way. Eight rounds to four? No way. Seven to five? Maybe. Cunningham was gracious in defeat. "I congratulate Hernandez for the win tonight," he said. "I fought hard and gave it my all. I know I'll will be back stronger than ever. There were two warriors in the ring tonight and this warrior still wants the belt back. Many thanks to my fans and God Bless"
The scoring shouldn’t reflect poorly on either fighter or the fight itself. Hernandez worked hard for his victory, which makes him the king of the division. Cunningham was nothing short of remarkable, having rebounded from a harrowing fourth round. And the fans were the biggest winners. It was a great fight.